Just arrived home from attending my first ever professional tennis tournament! It was exhilarating! It all started at an excruciating staff meeting. The kind of meeting where at the 2 hour mark you are feeling like one of those hotdogs in a rotisserie that has been revolving around the same issues for far too long and you just want to escape – even to it is means facing the prospect of an “overnighter” to finish the report cards that are due the next day. This is how I came to play tennis. I couldn’t engage in the meeting any longer so I pushed a note to my colleague asking if she ever considered playing tennis and before the end of the tortuous meeting we resolved to take lessons. From the first solid slice of the ball I knew that I had finally found a sport that I could not only enjoy but also use as a stress buster from those days of endless meetings and mountainous administrative duties. Tennis…I love it. It’s the reason why took up running and it is allows me to examine the gnawing uncertainty that stalks my confidence when I have the opportunity to take a match. Ta daa! 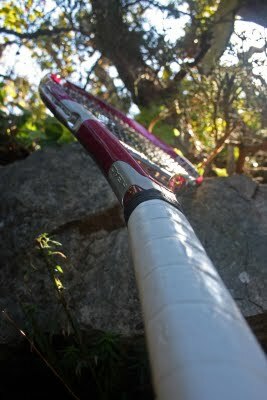 A new hot pink racquet! I spent a much longer period of time searching for and trying out different tennis racquets than I did purchasing my last vehicle and or my home. Oddly enough I’m even more excited about this purchase than a car or a house. What is that? I guess I consider a car just another utilitarian object. I’ve had my share of ‘clunkers’ so I am grateful to own a reliable vehicle but I don’t have a lot of personal investment in my car. Sometimes I feel more owned by my house and all the responsibility and provisions it requires rather than owning and thriving in this space. The racquet represents freedom. The chance to discover something about an experience that presents a new reference point each time I hit (or mishit) the ball. It also illustrates the chance to recognize the athlete in me which has never really been a part of my projected identity. The racquet also represents a very rewarding way to get to know people. I find it very interesting how rapport is developed across the net with one’s opponent. Over the course of several weeks our personal narrative is revealed in brief remarks or unexpected reactions. I won’t be reenacting the Castaway plot and formally name my racquet just yet. I just look forward to the joy of understanding more about the game and about others.